Pig in the Sunset. Digest304. I got the Sunset last night but missed the birds going home. This is an old joke that was sent to me by email. Old friends in the Sunrise. Alice is still doing fine at the Wolf Sanctuary. 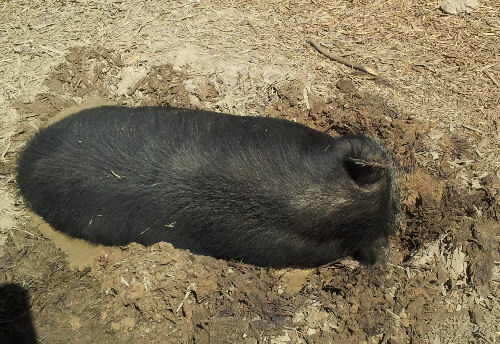 Last week she made herself and Angel a nice wallow for the hot days. 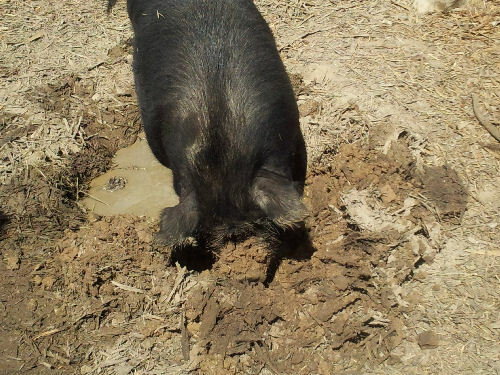 It`s one of the activities that pigs love, digging in soft soil. She waited until the existing hole was full of water and then dug it out to fit her body, and that was quite a hole to make with your nose. 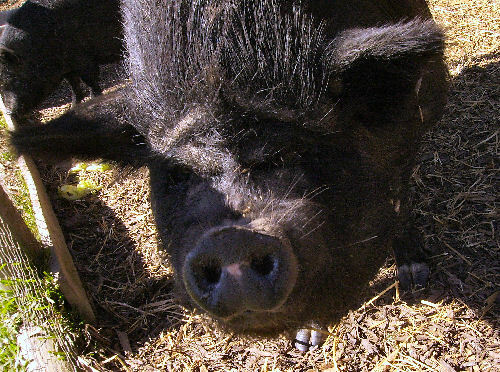 I often wonder how their noses stay so soft as she sometimes digs in hard soil. 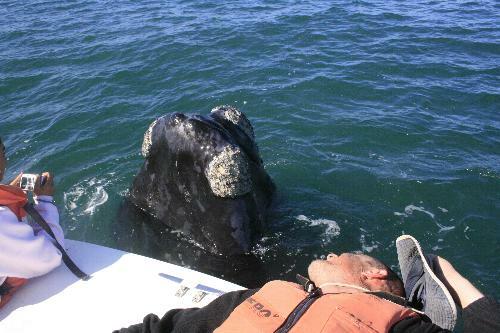 The Southern Right Whales are back again and still curious when they see the boat coming. Sometimes they go under the boat and we have to switch the motors off and lift them so we don`t injure them. At least they wave goodby when they leave the scene. The birds hover around so they can scavenge the skin particles that come off the Whales when they surface. 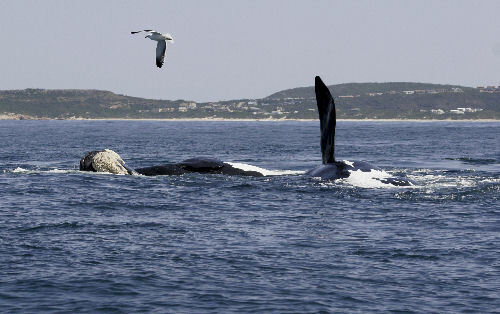 It`s quite an experience to be so close to them as I used to only see them from the cliff tops when I was in Hermanus. A not very interesting Sunrise this morning. I think it`s going to be a hot day. Birds from Sunrise to Sunset. 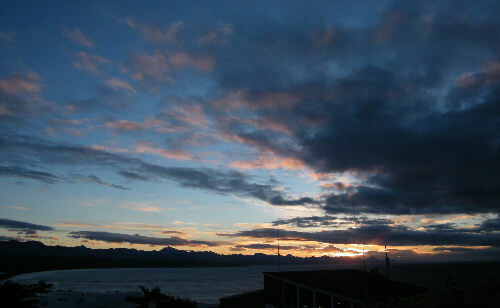 If you are lucky a bird will fly through the sunrise as this time of the morning they are just searching for breakfast. At Sunset most nights I see the Sacred Ibis going to their nesting place. 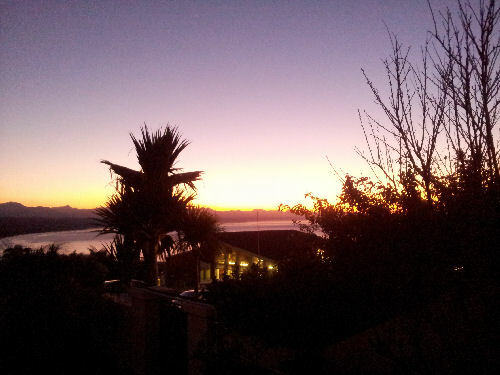 In the morning I look out to sea and the evening I have to go to the car park on the opposite side of the house. I`m finding this method of writing much quicker than the conventional way. Using a SIM card a lot of time is used getting photo`s on line. Last time I used one that was already online, so I want to see if it will take the photo`s off my computer. Also maybe this script is going to get converted to plain text. 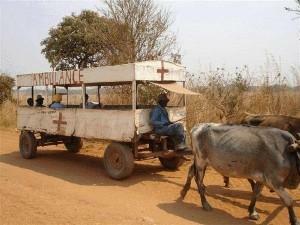 The hospitals and ambulance sectors still seem to be having problems, but we have a plan. My kitten caught her first mouse today and is very proud. Even birds get kicked out of the nest when it`s time to fly. One problem is that the pictures have to be centralized on line. I think I have found a quicker way to upload blogs using word. I am still experimenting with this new computer so maybe many of you are doing this already. This blog is a trial to see if it will upload a full blog. This will be removed as soon as it has been tested. I shall try a few photo`s to see where they are put on the page. The next thing must be different text`s. Well it seems to work OK and it accepts all text types. This works with several different blog sites. Morning blog from the Beach and Boat..
Another not very impressive Sunrise. I found a few photo`s from last week during my last trip on my daughters boat. 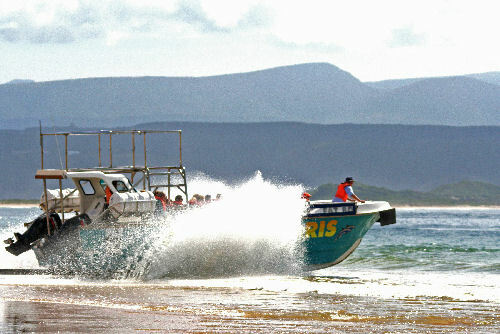 This is a usual launch where the boat is pushed into the sea by a tractor, when they come back in they must race up onto the beach. The underside of the boat is re-enforced so it acts like a sledge. 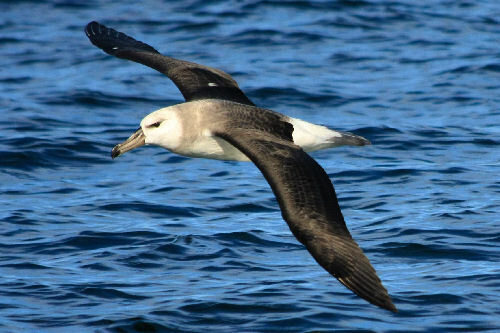 This is an Albatross and is the first time I have seen one near the boat. 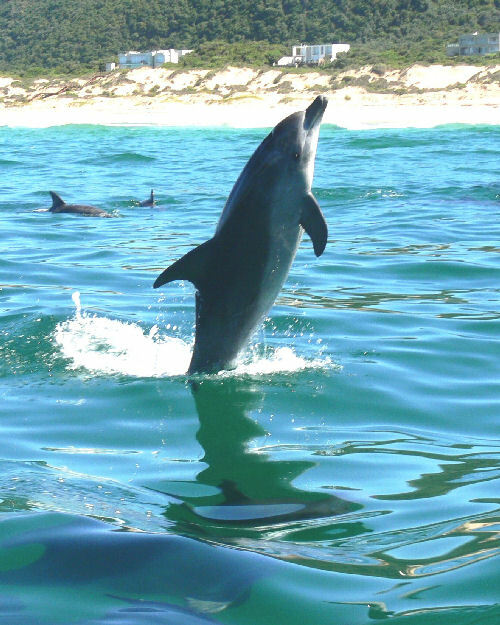 The Bottle Nose Dolphins were playing in the surf near the beach. The water was quite calm on this day. This was the same beach a week earlier when the surf was quite high. 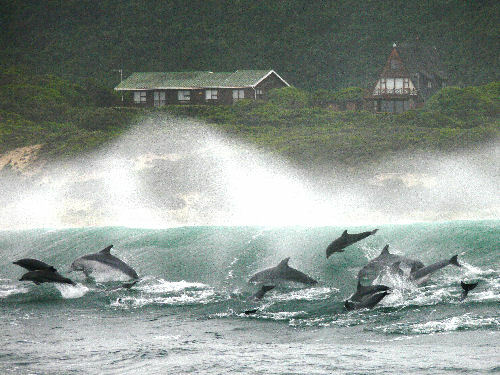 The Dolphins just love to play in the rough surf and fish at the same time. 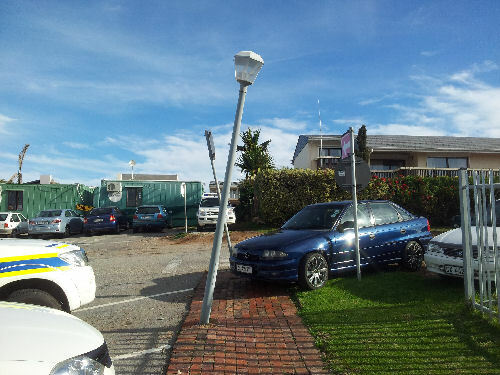 Since we have had a temporary police station blocking the road, the poles by the parking spaces seem to have taken a few knocks. As I said in my blog this morning, it was time to go and see Alice. She is still getting on OK with Angel but she is still the matriarch. 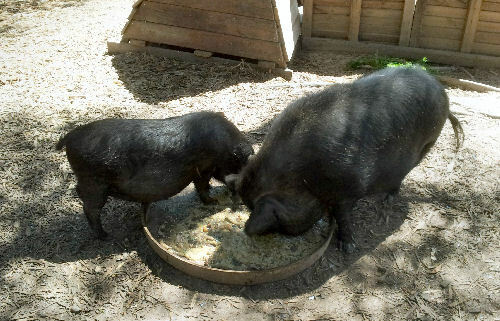 Angel always eats as quickly as possible but Alice likes to pick out the good stuff. If Alice spies something good she will push Angel out of the way to get to it. They are quite noisy about it and to most people, would sound like a fight starting. 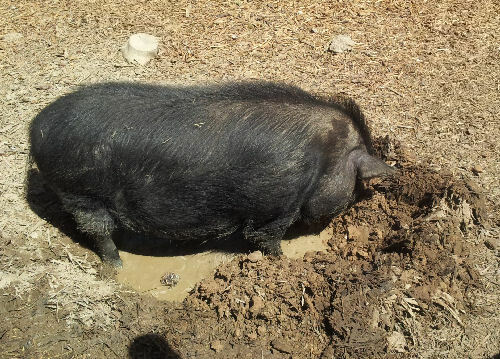 Alice decided to make a wallow that she could fit into as fresh water had just been poured into their bowl but the old wallow was filled also. 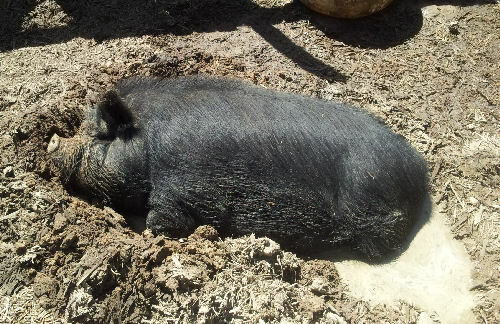 She set about nosing the soil out in all directions until it was big enough to lay down in. 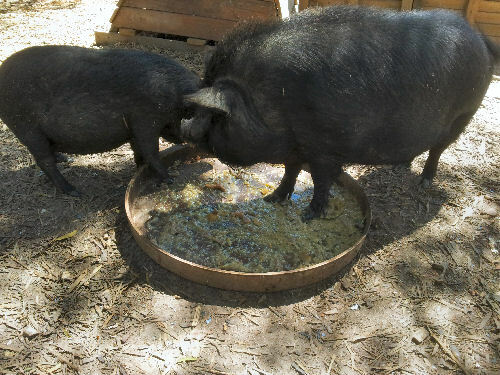 She didn`t make it big enough for Angel to join her so she went off and finished of the food that was left. This was taken whith night vision with a digital camera and doesn`t look very exciting. 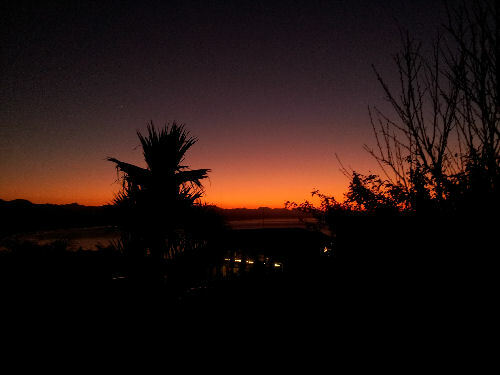 This was taken from the same spot with a faster speed and daylight settings and it looks like the actual sunrise. Sometimes the colors change drastically depending on the settings. I didn`t find that such a problem when using film, but at least we can always use a computer to fix it..